11/30/11 Meria interviews the Great-Niece of Al Capone, Deirdre Marie Capone on her excellent book “Uncle Al Capone”. On bestseller list at Amazon & Barnes & Noble for months; Italians – WOPs – non-whites; Growing up Italian in NYC; Al Capone was the first Italian millionaire; Al turned down the Trilateral Commission and OWO, thus the prison sentence for “tax evasion”; Al was exonerated on all charges in a retrial in 1991; Other bootlickers were the Rockefellers, Fords and Kennedy’s – no jail for them; Income tax – didn’t have to report money made illegally, it would be self – incrimination; the Federal Reserve; code of honor; drugged at Alcatraz, no more memory (mission accomplished); injected with Mercury; Deirdre’s NDE and premonitions; Al Capone’s premonitions kept him alive; the Chicago Cubs; “make him an offer he can’t refuse”; St. Valentine’s Massacre pulled off by crooked cops, not Al; prohibition and the Roaring 20’s; Nat King Cole and much more. 6 Responses to "Meria With Deirdre Marie Capone – Al Capone"
I think Ms. Capone made a mistake. She must have meant some other group when she said her granddad and uncle refused to join. The Trilateral Commission was created by David Rockefeller and a few others in the 70’s or 80’s, way too late for Al Capone to have known about. I figured she meant the Federal Reserve bunch and their cronies, like the Rockefellers (Rockenfelders). Guess he wasnt “gangster” enough for the criminals in chief. That was a really cool interview! I always thought there was something strange and CON-venient about the Valentine’s Day Massacre being blamed on Capone. Cops were mostly Irish back then – ‘Irish Need Not Apply’ was a sign actually hung up where work was to be had – so why would they kill their own, and cut off their booze supply too? It was the Germans, I said it. Or more appropriately, BAVARIANS! Also, very interesting about the mercury poisoning. Sounds Nazi to me. 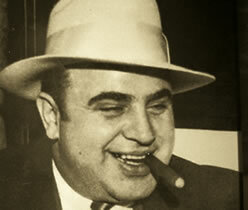 They could have learned a lot from this inventive family, but instead the Capone’s were vilified. Sounded like you were talking to your sister or cousin. Did your family have the stove and wine making in the basement? Seems most of my friends of Italian heritage had grandparents that had that custom going on! Fun show. Glad you enjoyed it. We have so much in common I laughed at most of the book. It’s great. My dad always had homemade wine, but didn’t make his own. Cooking was always going on and my parents fed anyone that walked through the door. They couldn’t refuse! The documentaries on the St. Valentine’s Day Massacre were always pretty vague about the details, but ended up blaming the whole thing on Al Capone. To me, the only way it could make sense is if it was perpetrated by some dirty cops. Glad she cleared that up. The book is great and I can hardly wait to start trying out the recipes. Thanks for the interview. I loved talking with her. Glad you enjoyed it.